Special Features: I have started to use these on my layout and now have replaced all the Building lights with these little Gizmo's. So much more light and especially when you use Window Curtains etc. No more hot lightbulbs that eventually burn out and heat up. On larger Buildings I have used two or more and I am stunned how much my layout at night is more realistic. 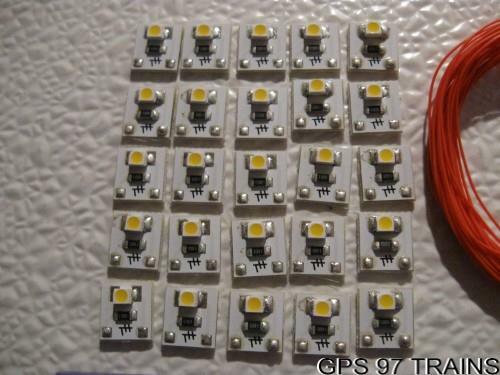 The lights can be used with AC or DC power from 12V up to 24V. It comes with 24" of decoder wire. The lights measure 10mm x 10mm.